Father Pradip Hazarika who run a small shop at A Sector here inform that his 6 year son Bikash who was a student of Class-III at Lower Section of Government Higher Secondary School, Kankar Nalla alongwith two friend Dipak Rai of Class-V of same school and another Kalim Hussain 10 years went on playing and reached near the hanging bridge near Helipad and take a bath at around 2 PM of July 2, after bath two of his friend come out of Book Nallah which tributary attached with the Dikrong river near the Hanging bridge and did not returned back. Bikas friend Dipak said that they were playing and reached the river side and cross the hanging bridge and the accident happened when the deceased saindal slip in water and to bring the saindal and slip and went toward the current water flowing of river Dikrong in spate owing to monsoon fury. lots of search was made by relative and friends but could not find. Later a FIR was filed at the Naharlagun PS last evening. The eyewitness Amina Begum said that three children were playing on the sand on the bank of river Dikrong and one out of them got missing and feared drowned. 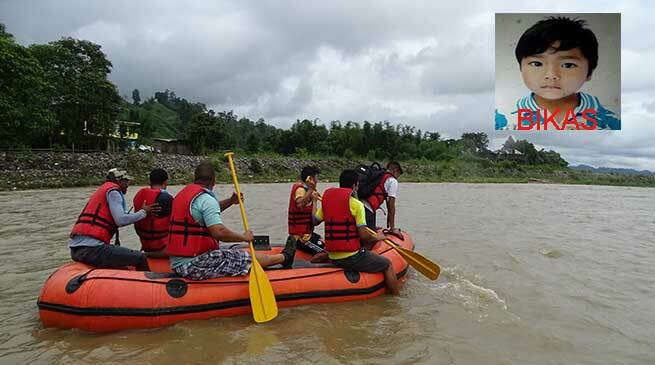 However team of Naharlagun PS led by SI SS Jha and SDRF team led by Tokmin Megu went on search of the Bikas all along the bank of river Dikrong towards downstream upto Banderdewa where the flow of the river water is slow but the search yield nill and returned empty hand. Taram also said that the Nirjuli, Doimukh and Banderdewa police have been alerted and asked to maintain vigilance toward river banks to avert such incident any more. He appeal the persons residing near the bank of river and hill slope to remain alert and maintain precautionary measure during monsoon fury.